It’s that time of year again… Summer comes to an end, leaves start to change, and the inevitable first snow appears in the mountains. To many this means the end of the hiking season, but to me it brings a whole new reason to get out in the alpine: larches. Once a year, around the beginning of October, these trees make a dramatic change from their typical green to a vibrant gold. 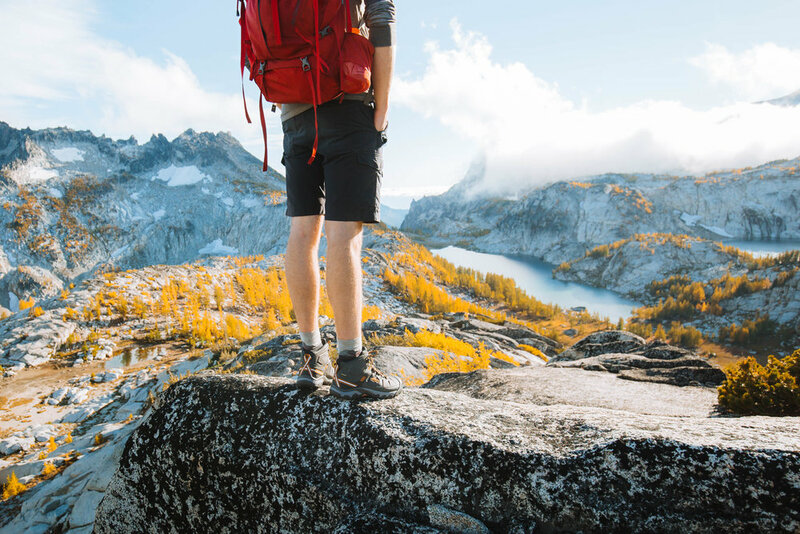 I was contacted by Zappos to try a new pair of Keen boots, and I figured where else would be better to document these boots than surrounded by groves of massive golden larches intermingled among pristine alpine lakes. A few friends and I met up at the Enchantments trailhead just before the break of dawn. 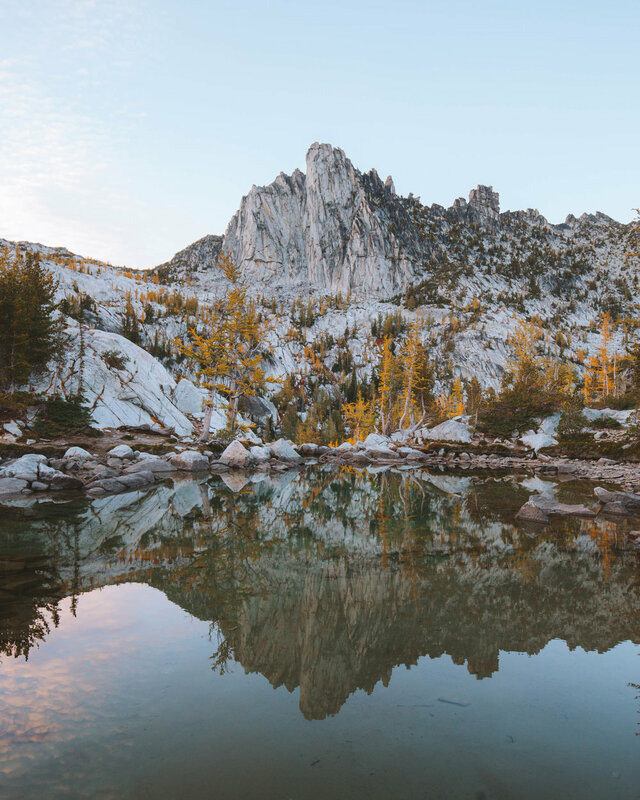 We headed out towards our first destination, Colchuck Lake, just as the sun started to rise behind our backs. Upon peaking the ridge of the basin, we marveled at the first views of the lake with cries of joy and excitement. I’ve been to Colchuck Lake a few times before, but this one was special. The lake was calmer than I’ve ever seen and larches dotted across the hillside. At this point we met face to face with our next opponent: Aasgard Pass. Roughly 2000 feet in about a mile makes this no walk in the park. Strapped sturdy to my feet, my boots provided the grip and comfort needed to climb a pass like this. As we approached the top, we saw exactly what we were hoping for, thousands of those special golden trees. Upon completing Aasgard Pass, the hardest part of the trip was behind us - or so I thought. We took a short break at Isolation Lakes, made some food, took some photos, and then continued on our journey. 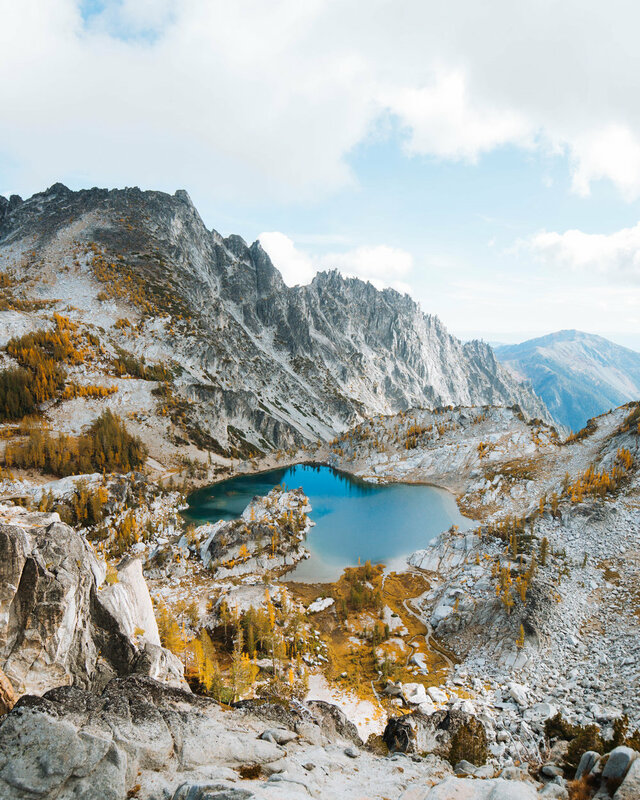 The best part of the Enchantments is after Aasgard Pass most all of the trail is flat or downhill. We wandered our way through the Core Zone, stopping at iconic lakes like Inspiration, Perfection, Viviane, and Leprechaun. The weather couldn’t have been better, with constant sun most all day. Waiting patiently for golden hour, we found the best place to set up shop for sunset. Typically this trail is done in a multi-day backpacking trip, but because we didn’t have overnight permits we had to finish in a day. Overall it took around 18 hours, with stops along the way. We hiked a total of around 20 miles, with roughly a gain of 6000 feet and a loss of 7500 feet. This thru-hike was my longest and most challenging day trip to date. Even with substantial wear in a day, my feet remained comfortable, dry, and ready for more miles.